Available in all sizes and metallurgy's. Regulates fluid levels by opening and closing depending onhigh or low fluid levels. Used where automatic tank filling is required. 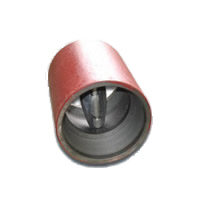 Used for measuring the flow or quantity of a moving fluid. Increases efficiency of any shallow well or jet pump by helping to control water flow. Available in bronze, cast iron, plastic and stainless steel designs from 1/2" to 8". Used to keep water from flowing back into the well and to keep the pumping system pressurized. Stainless, ductile iron, and bronze valves from 1/2" to 12". Pump control valves that automatically adjusts pump output to match variable flow requirements. 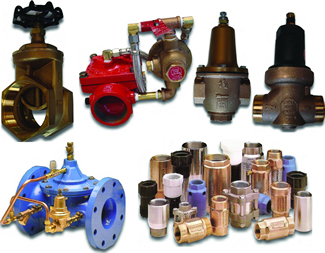 Available in Brass, PVC, Stainless, and Ductile Iron. Injection molded fittings in Schedule 40 and Schedule 80 designs. Used to control and divert the flow of water. Available in brass or cast iron. 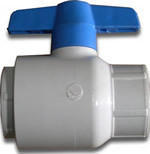 Used to control and divert the flow of water. Available in brass or PVC. A disk turning on a diametrical axis inside a pipe, used as a throttle valve or a damper. 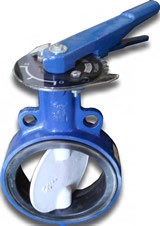 Self actuated safety valves designed to relieve excess pressure upstream from the line. 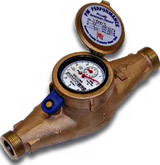 Maintains a pre-set maximum flow rate regardless of changing line pressures.